JUST COMPLETED, THIS BRIGHT BRAND NEW ALL BRICK WARM CONTEMPORARY SFH WAS CUSTOM DESIGNED AND BUILT BY AWARD WINNING STRATUM BUILDERS. WITH A SIDE YARD VARIANCE (MAKING THE HOME 1 FOOT WIDER THAN TYPICAL HOMES), THIS HOME FEATURES AN AMAZING 18' WIDE OPEN FLOOR PLAN WITH 5 LARGE BEDROOMS, 3.5 SPECTACULAR BATHS, 1ST FLOOR FAMILY ROOM, TONS OF CLOSETS & LARGE WINDOWS. THE EAT-IN KITCHEN FEATURES TALL SHAKER CABINETRY, QUARTZ CALCUTTA COUNTERS, PROFESSIONAL APPLIANCE PACKAGE, & 10' ISLAND! TOP NOTCH FINISHES & DETAILS THROUGHOUT INCLUDE 8' DOORS, BUILT-OUT CLOSETS, LED LIGHTING, 2 LAUNDRY ROOMS, RADIANT FLOORS AND MUCH MORE. DETACHED 2 CAR GARAGE & 3 OUTDOORS SPACES INCLUDING 2 ROOF DECKS. 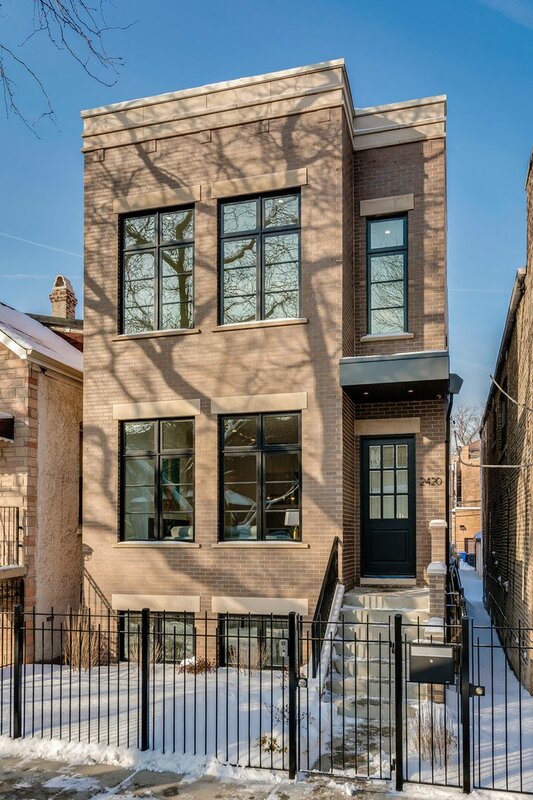 GREAT WEST TOWN LOCATION JUST STEPS FROM SMITH PARK ON QUIET TREE-LINED STREET! SHORT WALK TO METRA STATION AND NEIGHBORHOOD SHOPS & RESTAURANTS. Listing courtesy of Compass. Selling Office: Dream Town Realty.